Two Fat Treatments that work...without plastic surgery! Some of us tend to accumulate fat around our midsection, especially as we age. Others are simply genetically predisposed to carry fat disproportionately at any age. Sometimes exercise and healthy eating just aren’t enough to eliminate these stubborn bulges. Getting and staying lean enough may not be doable, sustainable or even healthy. Even when we succeed it may not look good, especially for women. With the bulges gone their curves may also disappear and their faces may appear gaunt. Lots of people have stubborn pockets of fat that just won’t budge no matter what they do. Until recently plastic surgery was the only option...Now there is CoolSculpting and SculpSure! As Calgary’s industry leader in non-surgical body-contouring, Skinpossible is proud to offer SculpSure and CoolSculpting Calgary, the non-surgical alternatives to liposuction. Both are clinically proven, FDA and Health Canada approved, non-invasive treatments that work to reduce localized areas of fat without plastic surgery. CoolSculpting and SculpSure! Why both? SculpSure and CoolSculpting each have unique advantages! Because we offer both we are able to offer greater body-contouring versatility to truly customize treatments based on the unique needs of our clients. We can do one or the other, or combine both treatments for optimal results. To learn more about each treatment please go to our individual treatment pages for CoolSculpting Calgary and SculpSure Calgary. Get the REAL "Skinny" on Body Contouring Treatments! Because some like it COOL and some like it HOT! SculpSure: Thermolipolysis causes the cellular death of fat cells by damaging their structural integrity by means of heat. CoolSculpting: Cryolipolysis controlled cold exposure, or energy extraction, to destroy fat cells through apoptosis. What size is a CoolSculpting Treatment area compared to a SculpSure treatment area? SculpSure: Each SculpSure applicator is about the size of a business card. One treatment consists of 4 business card sized applicators. The applicators are small but can be arranged in a variety of patterns to accommodate treatment areas of different shapes and sizes. CoolSculpting: Cooling devices come in various sizes to accommodate different shapes and sizes of treatment areas. How many SculpSure treatment areas are required compared to CoolSculpting? SculpSure: How many 4 Applicator treatments are required will depend on how many areas of your figure or physique you wish to have treated. Your transformation plan will be determined at the time of your consultation. CoolSculpting: Which shape and size of the cooling device will be required will depend on how many areas of your figure or physique you wish to have treated. Your transformation plan will be determined at the time of your consultation. How many treatments per area are required for SculpSure vs Coolsculpting? SculpSure: In order to ensure patient satisfaction, Cynosure (the manufacturer of SculpSure) recommends that SculpSure providers routinely encourage patients to commit to two rounds. CoolSculpting: Having performed thousands of treatments we have found that most patients only require one round to achieve satisfactory results. A second round may be required for patients wishing to debulk. How long do SculpSure and CoolSculpting Treatments take? SculpSure: Once all 4 applicators have been positioned in the treatment area(s) and the laser is turned on, the treatment time for SculpSure is very fast - only 25 minutes. CoolSculpting: With multiple machines, we can treat more than one area at a time. It takes just a few minutes to apply the cooling device(s) and then 35-45 minutes of treatment time is required. What do SculpSure and CoolSculpting treatments feel like? SculpSure: Cooling protects the skin while laser energy heats your fat layer. When the treatment begins it will feel warm and over time the heat sensation will increase to short periods of intense heat. The treatment is generally well tolerated but you may experience some cramping, tingling, prickling or squeezing sensations deep in the fat layer. CoolSculpting: The gentle suction of the new upgrades reduces discomfort during and after treatments. A thin gel pad protects the skin. The area will feel cool but not intensely cold for approximately 5-10 minutes, a sensation that subsides as the area numbs. The 2-minute post-treatment massage can be uncomfortable but is generally well tolerated. How much fat will SculpSure get rid of versus CoolSculpting? SculpSure: Clinical studies showed that up to 24% of the treated fat cleared after a SculpSure treatment. On average fat clearance is significantly lower, however, thus the need for a second round. Satisfaction ratings are very high but results vary. As with all treatments, results cannot be guaranteed. A few may be non-responders. CoolSculpting: Clinical studies prove that an average of 25% of treated fat clears after a single cool sculpting treatment when the treatment includes a post-treatment massage. Satisfaction ratings are very high but results vary from patient to patient. As with all treatments, results cannot be guaranteed. A few may be non-responders. How much does SculpSure cost compared to CoolSculpting? SculpSure: In order to make SculpSure a good value, Skinpossible has set our SculpSure pricing at approximately half what other clinics charge. A SculpSure treatment at Skinpossible will cost as little as $800. The 4 business card sized applicators that make up a single treatment is quite large. Thus, SculpSure pricing at Skinpossible is comparable to CoolSculpting pricing. CoolSculpting: The cost of CoolSculpting cycles at Skinpossible is a little as $600 for the Small device and $1200 for the Large. 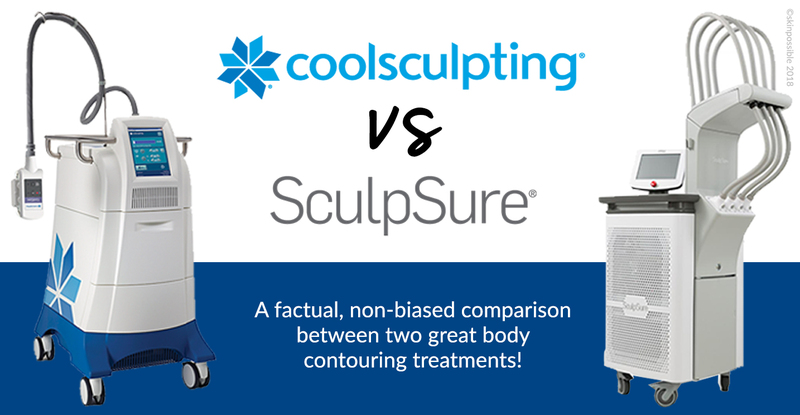 CoolSculpting pricing is comparable to SculpSure pricing based on treatment area size. What does it feel like after a SculpSure treatment and a CoolSculpting treatment? SculpSure: After SculpSure you may experience redness and bruising. Swelling and tenderness could last 2-3 weeks or longer. You may also experience tissue firmness or nodules. These will usually resolve within a few days, only occasionally lasting for several months. Most patients are able to return to their daily routine immediately after. CoolSculpting: The treatment area may be red for up to a few hours. Swelling and tenderness for a few days should be expected but may last longer. Bruising is also possible and usually resolves within a few days. Typically there is minimal recovery time and most patients are able to return to their daily routine immediately after the procedure. Do I need to do anything after a SculpSure treatment or a CoolSculpting treatment to make the treatment work? SculpSure: The treated areas should be massaged 2 times per day for several minutes in the weeks following treatment. Staying well hydrated and engaging in light physical activity helps mobilize the disrupted fat to process through the lymphatic system. CoolSculpting: The fat will clear gradually through the bodies natural physiological processes over the weeks and months following treatment. While the fat cells that clear will be gone for good, maintaining a healthy lifestyle, a consistent body-weight, and staying well hydrated are always recommended. How long does it take to see results after sculpture vs CoolSculpting? SculpSure: Approximately half of the fat will be cleared at 6 weeks. The majority of the fat clearance will be observed by 12 weeks although benefits may continue for 6 months post-treatment. CoolSculpting: Most people start noticing a difference at about the 4-week mark. The most dramatic results will be evident after 8 weeks. Fat could continue to clear for up to 16 weeks post-treatment. Are results from CoolSculpting or SculpSure permanent? SculpSure: Because the fat cells that clear after SculpSure are removed completely from the body, in our opinion, it can be assumed the results will be long lasting provided bodyweight are maintained. Clinical results measured at 6 months post-treatment prove this to be true. CoolSculpting: It has been in use since 2009 and is backed by over 70 clinical studies proving its efficacy. Studies done at 9 years post-treatment verified that the results had been maintained, thus proving that fat cells cleared after CoolSculpting are gone for good. For more information about SculpSure or CoolSculpting Calgary including videos and before and after pictures of results, visit the individual web pages for each treatment. Which treatment is right for you? Give us a call to book your free assessment/consultation! SculpSure is impressive technology, but it is new. Based on our current knowledge in most cases we would offer CoolSculpting. With the newest advancements, CoolSculpting is more comfortable during and after the treatment. With multiple machines and treatment times as short as 35 minutes we can treat multiple areas at the same time to save our patients time. While clinical evidence shows comparable efficacy, Coolsculpting that includes post-treatment massage is proven to clear more fat on average than SculpSure. The fat also starts to clear sooner after CoolSculpting. Provided a person is a good candidate, Coolsculpting is an excellent choice with very few risks, precautions or contraindications. Approved treatment areas include the abdomen, love handles, inner and outer thighs, back fat, bra fat, “banana roll,” upper arms, and underneath the chin. It is the most utilized body contouring technology in the world by a very wide margin. Because the SculpSure applicators are small (about the size of a business card) and can be arranged in various configurations to form diverse shapes, small areas of fat can be treated and people who do not have enough fat to be a candidate for CoolSculpting could be a candidate for SculpSure. Another reason why some people are not a candidate for Coolsculpting could be due to the shape or location of the localized fat they wish to have treated. Occasionally we have had to refuse treatment with CoolSculpting because we assess a risk of what we call indents (a sharp transition at the edge of the treatment area.) Because SculpSure tapers the temperature gradient, the fat reduction effect extends beyond the edge of the applicator. In such cases, the addition of SculpSure to our menu of services allows us to have greater versatility in body-contouring and treat people we might otherwise turn away. At times SculpSure is a better option. When other clinics only offer SculpSure and do not offer CoolSculpting, SculpSure could be their only recommendation under all circumstances. Perhaps they have not read the clinical evidence or do not otherwise have all the facts to be fully informed on the pros and cons of both. Since it’s introduction in 2009, CoolSculpting has continued to evolve. Prior to the introduction of the newest generation of cooling devices, a CoolSculpting cycle took between 60 and 75 minutes. The newer devices have shorted treatment time to 35 to 45 minutes. Treatments are also more comfortable with the new devices and post-treatment recovery is much easier. Not all CoolSculpting providers have invested in the newest upgrades. Skinpossible has had them as long as they have been available. 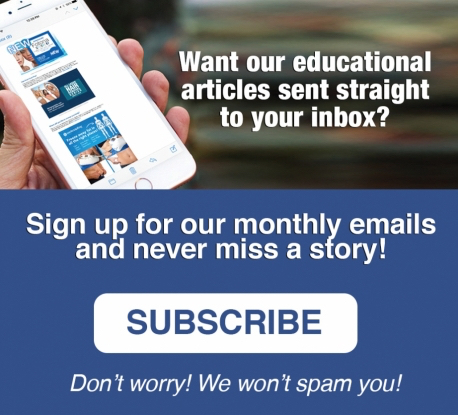 The clinical study that was done comparing the efficacy of the two treatments did evidence slightly greater fat reduction from SculpSure, but the Coolsculpting treatments that were part of that trial did not include post-treatment massage. Clinical trials prove that the two-minute post-treatment massage that immediately follows the removal of the cooling device increases the efficacy of Coolsculpting by up to 60%. With the inclusion of the massage, which is a standard part of all CoolSculpting treatments at Skinpossible, the efficacy of Coolsculpting surpasses that of Sculpsure. Absolutely! If this is what will work best for you, this is what we will recommend. In fact, since we have both technologies side-by-side in the same treatment room we can perform SculpSure and CoolSculpting simultaneously! Ultimately the choice of technology will be yours. Because we have three CoolSculpting machines and a SculpSure laser, technically four (or more) That would be rare and somewhat awkward unless you have the flexibility of Gumby. We have found that we can usually treat two areas with Coolsculpting easily and we do this every day. Now, with the addition of SculpSure, we can also offer CoolSculpting and SculpSure in the same treatment plan. Yes, if you only have one small pocket of localized fat we can definitely treat it with one of the numerous body-contouring options we have available. If you have several areas where you could benefit from treatment, we do encourage treatment to transformation so as to avoid being underwhelmed or disappointed. With SculpSure the second round can be performed 6 weeks after the first round of treatments. A second round may be recommended for CoolSculpting for those who wish to debulk. In this case, we can repeat the treatment after as little as 4 weeks. Additional rounds of either CoolSculpting or SculpSure can be performed for anyone wishing to see a further reduction after seeing the results from the first round of treatment(s). An ideal candidate is a person who is close to their ideal body weight with a stubborn pocket of fat that does not respond to diet or exercise. If you are within 20 to 30 pounds of ideal bodyweight you are probably a good candidate for the treatment of localized areas of fat. Visceral fat (deep fat lying underneath the abdominal muscle) cannot be treated with either Coolsculpting or Sculp-Sure. Neither of these treatments is indicated for weight-loss but even an obese person could potentially be a candidate for some small areas of localized fat that may be bothersome to them. It is important to have realistic expectations and recognize that all body contouring procedures (including plastic surgery) are not an alternative to a healthy lifestyle. The addition of newest generation of applicators known as Advantage and Advantage Plus was a game changer for CoolSculpting comfort levels. 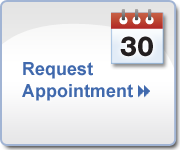 Not only have treatment times been shortened to only 35 to 45 minutes, but comfort during and after the treatment is remarkably improved. 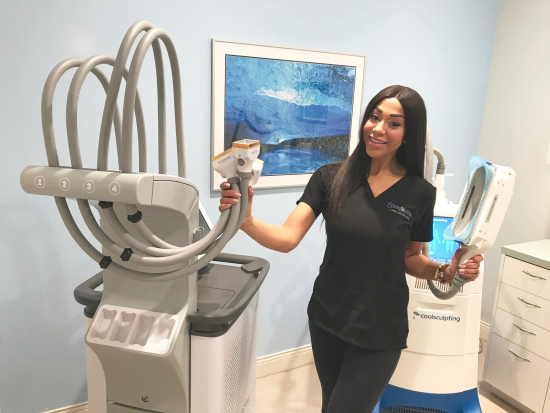 All of Skinpossible’s staff who have experienced both CoolSculpting and SculpSure have unanimously agreed that CoolSculpting hurts less than SculpSure. I should point out that both treatments are usually well tolerated and have little or no downtime. Skinpossible offers both SculpSure and CoolSculpting so we will cover all of this information with you at the time of your Consultation.